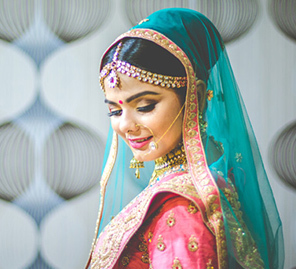 Dipti Satwani’s bridal trousseau was all about her feeling comfortable and looking beautiful at her destination wedding in Karjat. 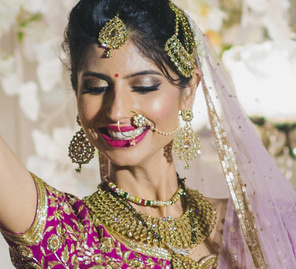 From unusual colors to interesting accents, Dipti’s choice of wedding ensembles for different functions revealed the many sides of her charismatic personality. Here, she shares her style inspirations with us. "I made a move to Seattle in the US very recently after I got married. Prior to the wedding, I lived in Mumbai where I was working as a marketing and brand solutions professional." "My wedding functions were held on the 13th and 14th of March at a resort in Karjat. We wanted to organize the wedding as a beautiful get-together for close friends and family, and the beautiful natural surroundings of Karjat really appealed to us. Plus, it was a very convenient location from Mumbai which made it easier for our loved ones in terms of travel." "As I was a part of the weddings-related industry, I definitely wanted to have unique looks for each of the functions. My personal style is not too loud, and hence I made selections accordingly. While I carefully selected the designers for each of my wedding functions, it was a custom-made ensemble designed by my sister Nisha Sainani that I picked for my mehndi in Mumbai. I specifically wanted an easy and feminine outfit which had traditional elements and yet looked contemporary. 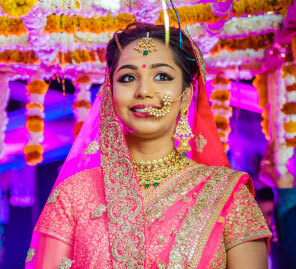 I wore a pink off-shoulder blouse with a voluminous lehenga adorned with delicate crystals and kardana work. This was also one of my favorite looks of my wedding as it was both lovely and comfortable. I paired the outfit with a traditional uncut necklace to show off the flattering neckline, and also wore a colorful 'maang tikka' (head ornament). My makeup artist Prerna Sainani Patil made sure I flaunted a flawless, fresh look which gave me glow and uplifted my entire look." "The poolside brunch was the first function at the destination venue in Karjat. Since the decor was very vibrant, I wanted to wear something fun, young and understated for this event, and still be able to stand out. The theme and ambience of the party were that of a picnic, and all the guests were given a blue dress code. Nisha designed a unique peach crop top and skirt which were perfect. It had lace and pearl detailing, which when paired with diamond earrings by Zema Fine Jewellery looked breathtakingly gorgeous!" "For the sangeet, I wore an absolutely glamourous plum gown by Shantanu & Nikhil as I wanted to keep the look strictly red carpet-western for this event. I also loved the custom set by Zema Fine Jewellery that was understated yet detailed, and was made using strings of diamonds in different shapes. They even gave it a rose gold polish so that it matched with my outfit perfectly." "For the pheras and reception I wanted a classic look. Anita Dongre was my safe bet as I believe she designs the best wedding lehengas which are also timeless. I absolutely loved my red 'gotta patti' outfit with a head dupatta which I removed for my reception party. My uncut jewellery set was also the result of a big search I undertook on my travels to Jaipur in Rajasthan. For all the other functions, my makeup maestros were Pakkhi and her team. She made sure that each of my looks were versatile and that I looked flawless. For the wedding, the emphasis on was on the giving me smoky statement eyes, while it was a subtle and soft look for my reception." "The after party was a relaxed event for youngsters, and close family and friends. For this, Nisha designed a very unconventional steel grey dress with a trail and gold detailing. The best thing about the stunning creation is that even though I felt very glamorous in it, it was also extremely comfortable during my impromptu dance sessions! For the jewellery, I went with gorgeous statement earrings and a happy smile." Whatknot photography did a fabulous job in capturing the candid moments and the happy vibe of the wedding. They even captured the untold moments of our guests and the tiny décor details that we had so painstakingly planned. "Weddingsutra is a ‘one-stop-shop’ for wedding related resources. I loved all the vendors I worked with and had a great experience with my makeup artists. It's always easier when you give your make-up artists full freedom to plan your look. My advice would be to have a trusty fashion stylist or a friend to help you decide the looks for your wedding. For me, it was my sister Nisha Sainani, who helped me style my wedding attire. Being a designer and someone who knows my taste, she was of immense help. It was great having her by my side when planning my outfit colors, styles and overall looks for my wedding functions."